Franke Washroom Systems, also known as Franke Sissons, has added two new ranges of hand dryers to its portfolio. The Eco Air Blast Midi is available as 550W or 1100W and is a hands-under aircurtain dryer. High powered and economical, the dryer is suitable for commercial use. An eight to 14 seconds drying time is achieved with a 325 kph air speed over a wide surface area. The Eco-Airblast uses 1.83Wh per use and costs 0.04p for 200 uses, says the company. 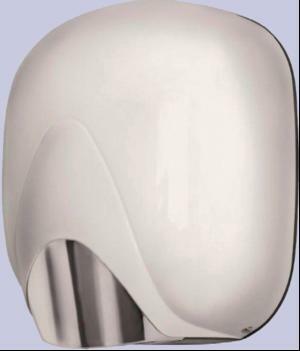 An optional HEPA filter catches 99.9 per cent of airborne bacteria and a protected Agion silver-ion coated surface adds further hygiene protection. Covers are available in white, polished or satin chrome. The Maxi 1750W hands-in dryer, has no heat element but recycles heat from the motor to generate warm air for a dry time of 10-12 seconds. An internal tank catches excess water and at 69Db, the Tornado is one of the quietest hand-in dryers and claims to use 4.8Wh of energy per use. A HEPA filter, which captures 99.9 per cent of airborne bacteria is available as are Puretab tablets.